Both the iconic sights and the hidden treasures of Australia’s legendary Red Centre are revealed on this enthralling journey through never-ending red plains and sprawling cattle-stations. 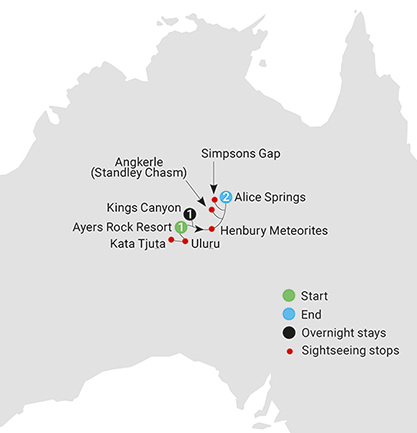 From world-renowned Uluru and Tjuta Anangu to a little-known site where an immense meteorite struck the Earth more than 5000 years ago, each day will provide genuine opportunities to experience the life, culture and traditions of the Outback. 5 day/4 night Outback Australia – the Colour of Red tour including hand-picked accommodation, complimentary refreshments throughout the journey, daily breakfast, 3 lunches, 4 dinners & airport transfers.